A campaign is a series of ads with some recognisable consistency between one ad and the next. Seldom done in education advertising here. Each department seems to have its own ideas. This is the only print campaign I’m aware of in recent times in the WA market. A good campaign occurs when an ad receives a higher cut-through than it would as a stand alone ad; ie the individual ad benefits from the history of previous advertising. Example: the Apple iPod bus-stop ads. Each one adds something to the overall imagery of the campaign and because the visual legacy is strong and positive, each new ad is immediately recognisable. There’s a pretty strong contrast here between the visual appeal of the iPod ad and the visual yuckiness of the ECU campaign. The ECU campaign is going nowhere. The ad is unfriendly, gray and intimidating. Yeah, I’d really want to go to a university like that. What sort of people launch into tertiary education AFTER they’ve started a business? Ambitious people. People who think they’ll derive a benefit. So show them a benefit in your advertising. It’s an awful campaign. 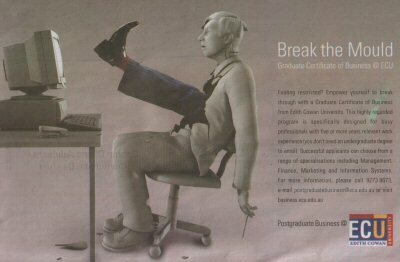 The ECU marketing people should be put in plaster castes and the ad agency should be made to study tax law. Previous Article← What IS IT with people hanging around lifts? No to mention the fact that to really break the mo(u)ld, you have to wear orange socks. There’s something about a lef coming out of someone’s chest that is, I dont know, disturbing…I wouldn’t WANT to break a mould like that.